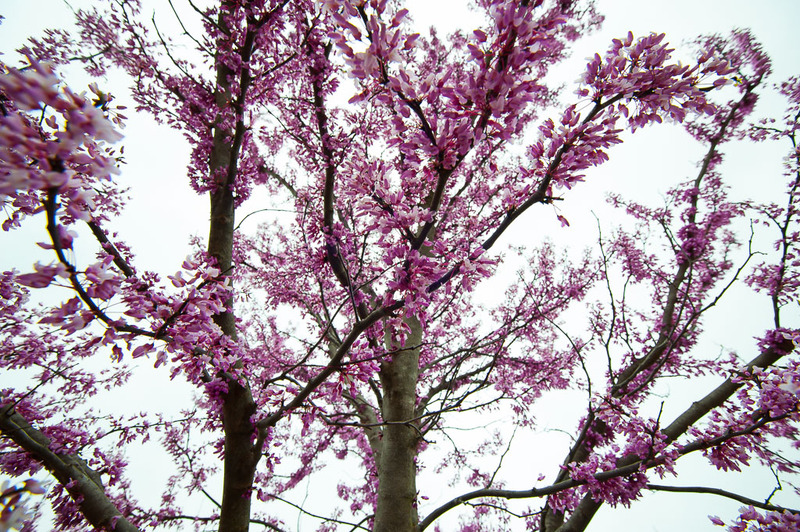 This sea of redbud blossoms is about to ebb into green leaves. 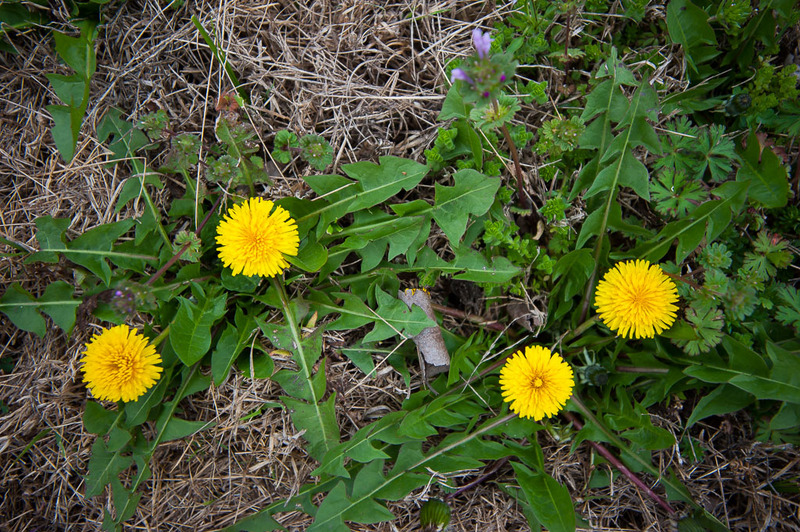 Dandelions begin to populate our pasture. Abby and I spotted a pair of roadrunners in the pasture the other day. That’s pretty cool. We didn’t get a change to photograph them. 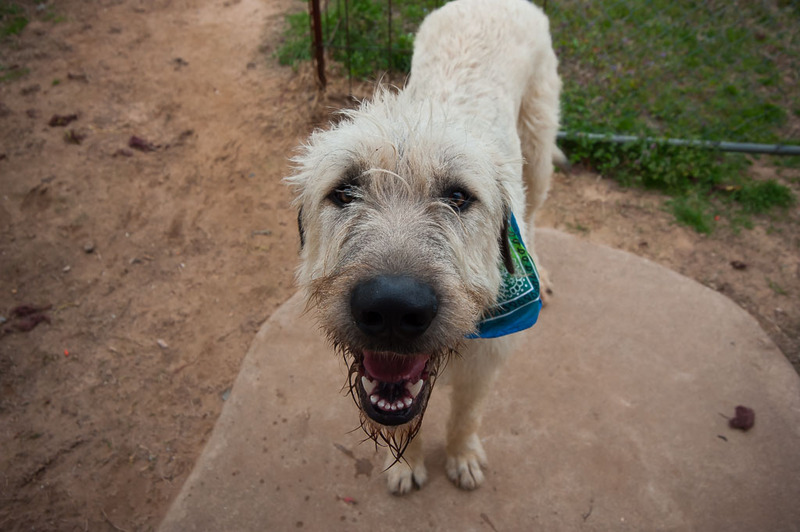 They were not being chased by a coyote, and it should be noted that since we got Hawken the Irish Wolfhound, we haven’t seen or heard even one coyote. We used to see, and especially hear, coyotes all the time. I have make excellent strides in the garden, but my plans are so ambitious that it may be another week before I get seeds in the ground. This is a wild plum tree, visible on the trail in the woods to the north, where I walk Hawken. The redbud, our excellent flowering tree in the front yard, which we got from the City of Ada for free after they had a giveaway following an ice storm (even though we don’t live in Ada), has made the very first green leaves from it’s excellent pink/fuschia buds, meaning that soon it will be just a tree, albeit a nice one. It is the State Tree of Oklahoma. 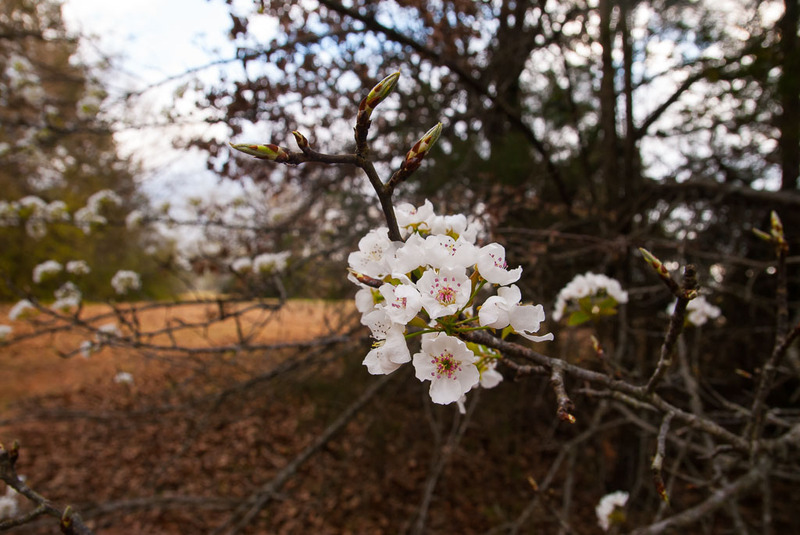 The peach blossoms are the same way – almost leafing out. Soon, hopefully, we will see tiny peaches. 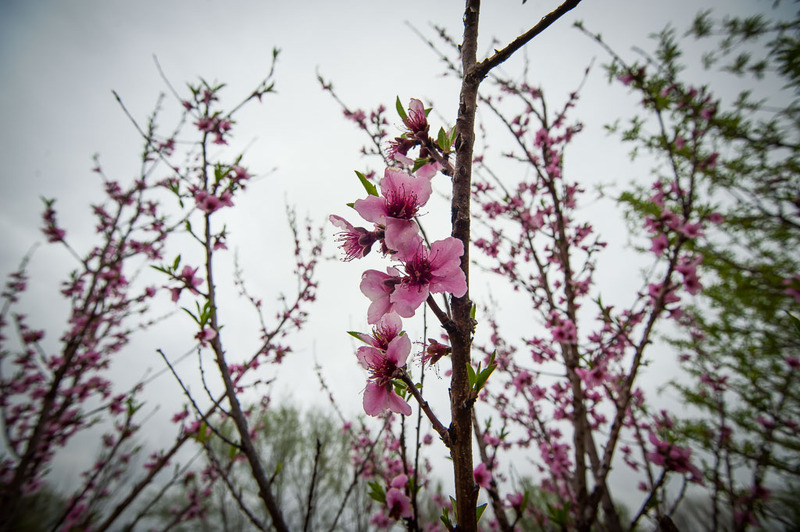 I have a couple of varieties of peach trees, with different blossoms and different blooming times. These are among the last blossoms of the spring. Hopefully, peaches are on the way. Hawken the Irish Wolfhound keeps watch on me today while wearing his paisley bandana. Abby and I watched two Jennifer Aniston movies recently: Cake, her most serious, and Office Christmas Party, her least serious. It got me wondering about celebrity, and if celebrities are, or even can be, happy people. I’m pretty certain I’ve never seen a celebrity on the trail at Canyonlands or at a shop in Santa Fe, and it’s hard to imagine someone like Aniston or Michael Jackson or George Lucas or the Coen brothers out in the garden like I was today, clumsily pounding fenceposts into the corners of the patch and tilling an additional spot for Abby’s squash plants. I wonder of they all have Mexican gardeners and private reservations at Aspen, and I wonder what that must be like. What’s it like to be a barely-relatable public icon, gushed and fawned over by an unwashed, worshipful fan base? 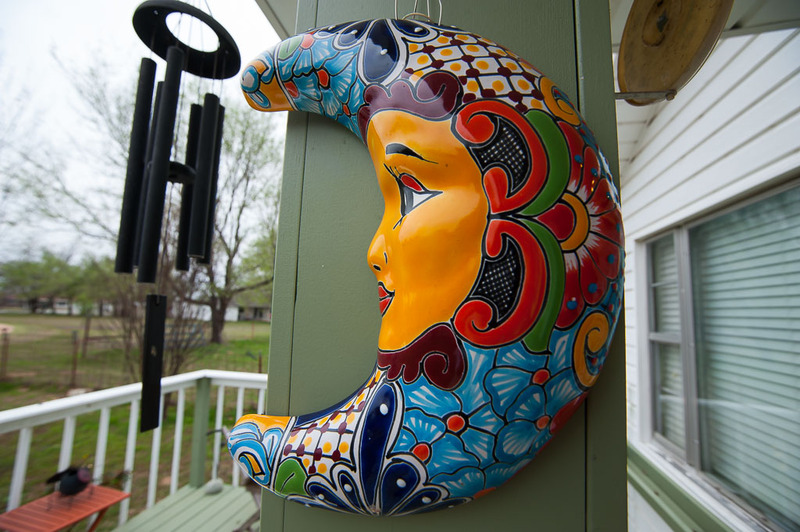 Abby and I bought this in Santa Fe a couple of years ago and I just got around to hanging it last week. Nice to hear about the goings-on on the farm. I talked to a kid today who just got back from spending his Spring Break in L.A. He took the Celebrity Tour of Homes. He said the bus driver urged the passengers to keep an out for George Clooney. Sure enough, he said Clooney was sitting out in the front yard of his Beverly Hill mansion, smoking a cigarette and reading a book, just like a regular Joe. I’ve only ever met a couple of celebrities, not enough to develop a general feel for what they are like in private, but I’ve always heard the biggest of them are extremely nice people. I’ll bet Clooney’s very nice. I don’t think I’ve met any celebrities. And I certainly don’t know what I’d be like if I was one. I do, however, believe it’s immoral to be wealthy while others are suffering. (No, I don’t know where the line is between “comfortable” and “wealthy”. I know I’m not in the “comfortable” crowd yet.) Yes, it costs more to live in L.A. But no, no one needs a 22-bedroom mansion with a bowling alley in the basement. Build an actual bowling alley with that money, in a neighborhood or city that doesn’t have one. Put those extra rooms into other houses for people who need them. On the celebrity question … I think if I were famous, I would want some degree of insulation from the general public. It’s exhausting to act friendly all the time. I want to know what book Clooney was reading. Not famous, but wealthy: a few houses down from my cousin’s country place is a family who won the lottery. They built two houses — one for themselves, and one for their children. Then? They built a fire station and a playground for their community. Cake is one of my favorite movies.